I really hesitated before writing this post, because I may be harming my own self-interest by doing so. It’s happened before, like the time I wrote a column praising the fig jam I bought at the Raleigh Farmers Market then couldn’t find any when I wanted some. But I’ll go ahead. It’s just us, after all. A fascinating pop-up restaurant will open for three days only at The Cookery in Durham, N.C. – and it has a great pedigree. Hakanai will offer traditional, but not stereotypical, Japanese flavors along with house-made bonito and soba, Billy and Kelly Cotter, owners of Durham’s Toast, will be in the kitchen and out front. Chef Billy Cotter has been a sous chef at Magnolia Grill and Lantern, and Kelly Cotter is a veteran server and manager. Scott Richie of Whiskey will be behind the bar, and Bull City Burger and Brewery will create a special beer to go with the menu. The Cookery is a food business incubator that helps entrepreneurs who need kitchen space or marketing help. Hakanai will be staged in its event space, which opened in September. Owners Rochelle and Nick Johnson plan to host more pop-up restaurants in the space. The restaurant will be open by reservation only Feb. 1, 2 and 3; no walk-ins will be allowed. The Cookery will begin taking reservations at 10 a.m. Dec. 9. Reservations will be taken only at www.durhamcookery.com. Rochelle Johnson says that a price for the dinner will be set early next week and will be posted on The Cookery’s website. Send a big box made in N.C.
North Carolina has so many good local food companies that it’s silly to order holiday gift boxes from California or some such place. I like to give both ex-pats and never-lived-heres a taste of my beloved state. I used to have to pack my own boxes of local items. And that’s still a good option if I want to collect jams, jellies, candies and honey from a farmers market and add some of my homemade bourbon balls and rosemary pecans. But there are others who can do the work for me (well, except for the bourbon balls and pecans). A Southern Season in Chapel Hill, N.C. has long offered a variety of North Carolina-themed food gift collections including items from sweets to country ham. Look at the store’s offerings here. You can also send your friends Bone-Suckin’ everything – barbecue sauce, mustard, rubs, teriyaki – from Raleigh’s Ford’s Gourmet Foods. The company’s sauces have been collecting accolades for 20 years. Find out more here. Now, the state’s first food business incubator offers collections of items made by the artisan food producers who work with it. Blue Ridge Food Ventures near Asheville, N.C. is offering four options for boxes that contain six to eight local products: Hot Box, Not Hot Box, Sweet ‘n’ Spicy Box and Fine Flavors Box. Items in the boxes are made by small companies that work at the incubator or who got started there. Find out more and order here. The Sisters in Pie held their annual Thanksgiving Eve meeting today, and I believe the results speak for themselves. I so look forward to this each year, when my neighbors Kay and Cathy (aka Queen of Pie) get together to make pies for our respective family dinners and finish off any bottles of red wine that might be in my refrigerator. Because Cathy is the expert crust-maker, she prepped and rolled every inch of the pie crusts. That’s something like 12 crusts. Kay and I chopped fruit, handed stuff to her and refilled her wine glass. Those tasks we can do. Cathy taught me to make pie crust, and I can do it. But comparing mine to hers is like putting Pashmina next to a silk scarf. But I have vowed to get there. That, someday, my crusts will be as smooth and flaky as hers and not look like a 4-year-old was let loose with Play-Doh. Our pie day is a tradition that we all enjoy, and I hope we can keep it going. It really means a lot. And The Hub is even learning to pat and roll. We made our usual apple pies this year, with fillings full of cinnamon, mace and a dash of cardamom. Plus some spirits: cognac in mine, dark rum in the other two. Pumpkin? Oh, come now. So overdone. 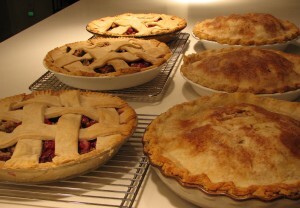 We added our adapted version of a cranberry pie recipe in “Southern Pies” by Nancie McDermott. Below is our edition – which has a little kick, naturally. Preheat the oven to 350 degrees. Line a pie pan with one of the crusts. In a large bowl, stir together the remaining ingredients. Pour into the pan. Use a pizza cutter to cut the remaining crust into approximately 1 1/2 to 2- inch wide strips. Weave them across the top of the filling in a lattice pattern. Place the pie on a baking sheet to catch any drips. Bake until the filling is bubbly, about 40 minutes.